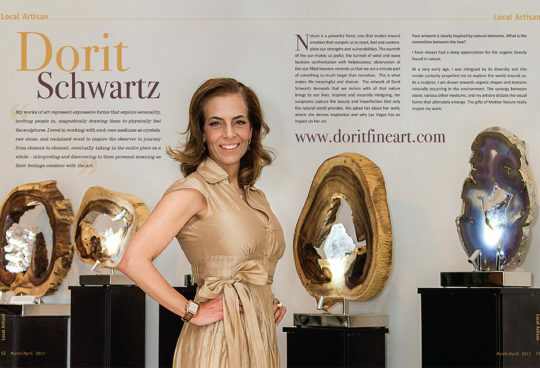 Local sculptor Dorit Schwartz, whose well-known for her work with St. Jude Children’s Research Hospital, will showcase several new pieces and prints during Ascaya’s Art in Architecture event Sept. 5 from 4 to 7 p.m. The free event welcomes guests to meet Schwartz and view the new additions to her “The Light Within” collection that will reside in the luxury custom home community’s clubhouse until Sept. 14. Schwartz, who is returning to Ascaya for a second time, said the community with 313 custom estate sites, exemplifies the beauty and strength of the desert. Schwartz’ work is internationally known, and she is one of 12 artists selected for an upcoming Art &BMW showing at the Osaka BMW showroom in Japan. Her BMW Art Car will debut Aug. 30 in conjunction with Japan’s American Chamber of Commerce, Kansai, Food Bank Kansai and Kitano Art Gallery. In addition to Ascaya, Schwartz has pieces that are on display at the Wynn Home Store at the Esplanade of the Encore Hotel, the Art360° Exhibit inside the Mayor’s office at City Hall, in Japan and in galleries throughout the country. “The Light Within” is a collection of crystal and wood sculptures that were inspired by Mother Nature. Schwartz said a new addition to the collection, hand-painted lithographs, offers a fresh take on the sculptures and will be individually numbered and signed. All of Schwartz’s pieces that will be on display are available for purchase. Pieces from this collection can be seen at various locations throughout the city of Las Vegas, such as The Discovery Children’s Museum, The Lou Ruvo Center for Brain Health, Downtown Summerlin, Summerlin Hospital, UNLV, City Hall, and Symphony Park at The Smith Center.